Promotional gadgets are some of the best gifts to invest your all important marketing budget in. When you decide one your promotional gifts you should consider what you hope to achieve with the investment. Visibility, longevity and increased brand loyalty are all key and these points will be hit with promotional gadgets. Our array of unique and interesting gadgets are sure to find homes on your customer's deck, be picked up and shown off frequently and remain in that position for a very long time! 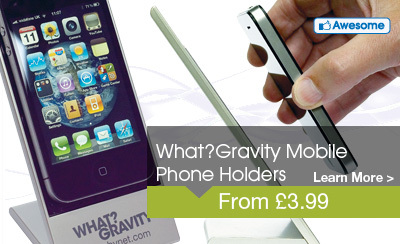 Our range of unique gadgets range from unique 'gravity defying' promotional phone holders to sim card readers and iPad holders. Whatever your company message and ehtos we are sure to have the promotional gadget to make your business really stand out from the crowd.